Excellent article. 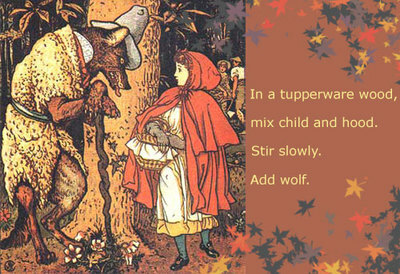 A great resource for the book-length Red Riding Hood poetry manuscript I am working on. Also, I really enjoy the journal, especially today's featured pieces. This is wonderful! Thanks, Terri. The poems are beautiful and the article also. We're preparing for a special issue on wolf folklore and fairy tales at Dante's Heart, and this resource you've offered is very inspiring. John Unger's sculpture is chilling. 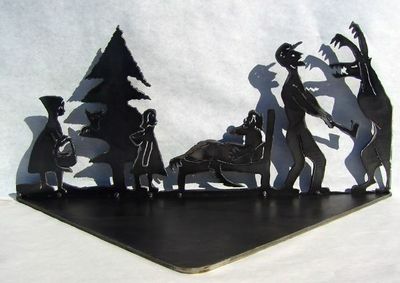 It doesn't look like the woodman is going to win, for the wolf appears with such ferocity, and the man with his hatchet looks more afraid than wrathful. Daniel: I look forward to the wolf issue! Have you looked at Kiki Smith's wolf & Red Riding Hood imagery?